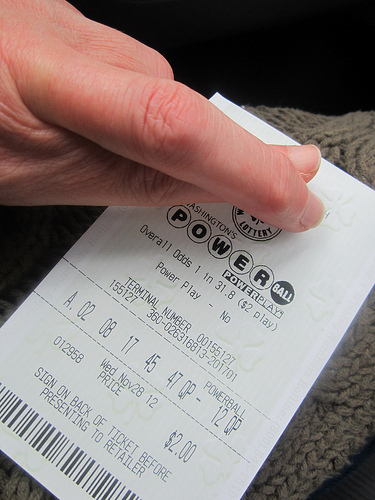 More money, more problems: why I don’t want to win the lottery. ‘That’s the most ridiculous thing I’ve ever heard.’ That’s husband Bill speaking and if you’re following my writing you’ll know it’s something he says often. Especially to me. We are sitting at the table and Bill is hunched over a 10-number auto pick ticket with a pen, marking off the lottery numbers that have just been drawn. What would it be like to win 70 million dollars? Bill puts down his pen for a moment, leans back in his chair and folds his hands behind his head. I take it this Mercedes C63 has room for the Prince G’s car seat? He picks the pen up again, and goes back to marking off numbers. You’d spend your days hiring and firing staff? I feel tired just thinking of all the responsibility. I feel pretty tired to start with. I suspect Prince G might be teething. And 70 million isn’t going to stop that. Would I have to start wearing make-up? ‘I couldn’t be a passenger in a Lamborghini dressed like this?’ I look down at my baggy pajama pants and Bill’s old t-shirt. I shudder at the thought of having to move my personal appearance up my ladder of priorities. You could say I like my comforts. But it’s not like they’d make me significantly happier. I recently read on Wait But Why an article about why Gen Y are unhappy. The bit that stuck for me was that happiness occurs when your reality is better than your expectations, and sadness is when your expectations are higher than your reality. The 70 million would certainly increase expectations, but the improvement on reality couldn’t be guaranteed. I have an idea. ‘In fact, what’d make me happier is donating 65 million to charity and helping thousands of people instead.’ The other 5 million I could handle without having to hire staff or alienate my friends. To say we have differing thoughts on charity donations is an understatement. I almost see the steam rise from Bill’s ears. He grunts and throws the pen down on the table with a clatter. But I don’t tell him that. I’ve stirred him up enough for one night. I simply stand up, kiss him goodnight on the forehead and head off to bed.